Marie (second from left) and Emil (fourth from left) have been reunited with their oldest sister Emmy (far right). Marie and Emil are typical seven-year-olds. Marie loves going to school and playing dodgeball with her friends. Emil, while less outgoing than his sister, also loves going to school and has a passion for soccer. What makes Marie and Emil different from their peers is that they spent the first five years of their lives as wards of the Noel Orphanage. Established in 1954, Noel was the largest and oldest orphanage in Rwanda. The institution was originally created to care for infants whose mothers had died in childbirth, but over time its mission and population expanded. By 2012, it was home to 529 residents ranging from new-born infants to disabled adults, and was overcrowded and under-resourced. Located in a remote part of Rwanda just across the border from the Democratic Republic of the Congo, the orphanage often struggled to meet the needs of its residents. When I visited the Noel Orphanage a few months ago, what I saw was not rooms teeming with children, cribs lined up side-by-side, and loads of hand-washed laundry hanging to dry, but rather silent, empty rooms. How did this happen? Where did all of the residents of Noel go? 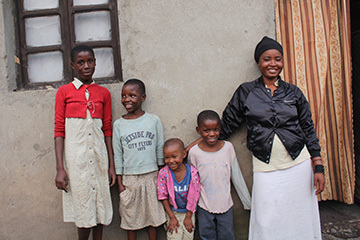 Three years ago, the government of Rwanda undertook the ambitious challenge of closing all orphanages within the country in an effort to provide Rwanda's orphans with homes with family members or foster and adoptive families. This movement of deinstitutionalization started in the United States and Western Europe in the 1940s and 50s and in Eastern Europe in the 1990s after the fall of Communism. In the last decade, with support from their national governments and donors like UNICEF and USAID, additional countries have begun implementing deinstitutionalization policies. Research shows that children raised in orphanages experience delays in physical growth, as well as cognitive, emotional and behavioral development. Children in institutions are deprived of the individual attention and stimulation they would normally receive in a family setting. Any attach¬ment to caregivers or other children are broken by staff changes and children being relocated. Consequently, children raised in institutions are often unable to form healthy emotional attachments, which can lead to many emotional and social development issues during their formative years. In Rwanda, orphanages also have symbolic meaning as very few existed before the 1994 genocide. The proliferation of new institutions that emerged to care for children who lost their parents or were separated from their families due to the genocide was significant. The number of children cared for by the Noel Orphanage nearly quadrupled between April and September 1994. As orphanages became more prevalent, they became an easy solution to a complex problem. Unfortunately, orphanages do not address poverty, which is the underlying cause of child abandonment, much less the kind of psychosocial support needed after the genocide. Very often the orphanages divert energy and resources from other initiatives that could strengthen the capacity of vulnerable families. This is why in Rwanda, USAID's Displaced Children and Orphans Fund supported the program Ishema Mu Muryango ('Pride for the Family' in Kinyarwanda) to reintegrate children from institutions into their families or communities. The program also worked to prevent further institutionalization by providing community-based support for vulnerable families. The program was implemented by Global Communities in partnership with Hope and Homes for Children. As of June 2015, all children from Noel have been placed in communities with family members or foster parents, while the adults have transitioned to independent living or small group homes. Social workers with the IMM program located Marie and Emil's oldest sister, Emmy. Despite the fact that Emmy had been living near the orphanage for years, she had never met her youngest siblings. Emmy's father had died when she was young and her mother passed away while giving birth to Marie and Emil when Emmy was 16. Emmy and her two older siblings, Lucie and Joseph, were split up and sent to live with different relatives. With no mother to care for them, Emmy's relatives decided to send the newborn twins to the Noel Orphanage. As the years passed, Emmy left her uncle's home, got married and had her own daughter. Eventually she brought Lucie and Joseph to live with her, but the strain of raising three children proved to be too much for her husband. So at the young age of 21, Emmy became the sole supporter for her two siblings and her own infant daughter. Emmy proudly displays her kitchen garden which she created with support from the IMM program. When the social worker located Emmy, she was already struggling to support her household of four. While her heart ached for Marie and Emil, she wasn't sure she could support two more children. But with support from IMM, she was connected to resources that helped her. With a little money from relatives, she got a small house. With the IMM support, she bought some furniture. A community volunteer, trained under the IMM program, helped her set up a kitchen garden. 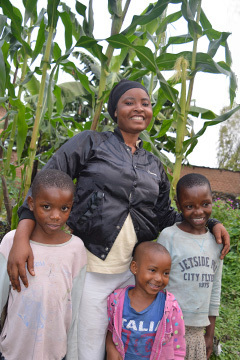 And through IMM she was connected to a nutrition group and a playgroup, where the twins could play games, sing songs and socialize with other children. The transition for their new family was not always easy. Initially the twins did not communicate and felt strange coming into a new family. But before long Emmy saw many noticeable changes, and today the children continue to adjust well. "Now," she says, "they go out and play with other children. They socialize and go to school." The family still receives regular visits from the social worker who helps with the family's transition. Emmy also has support from an IMM community volunteer who acts as her mentor. "She comes to talk to me and give me encouragement," says Emmy. Despite the challenges of raising five children on her own, Emmy remains resolute. "Nothing but death will separate us now. I am determined we will stay together." NOTE: The names in this story have been changed to protect the privacy of the family.